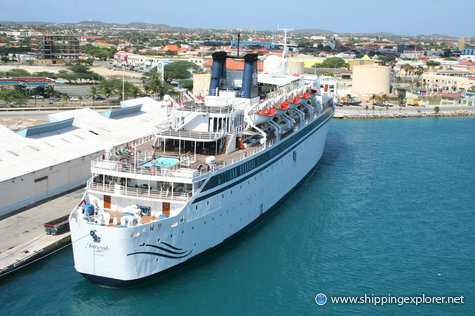 Oct 2009 Maritime Reporter puff article on Freewinds after its major asbestos clearing refit & tart-up..
April 2010: St.Lucia: Archbishop warns against Scientology Invasion! MarineTraffic.com, Live (AIS) Vessel-tracking website. Curacao: overlooking the mooring where Freewinds usually docks. Last edited by Sponge on Thu Jan 12, 2012 9:05 pm, edited 5 times in total. She is currently batting round the ABC islands. The Curacao WebCam has been "suspended." Did the little commodore not like the Eye in the Sky? But Curacao (Willemstad) is still within range of MarineTracker. Thanks for the awesome timeline link. I'm going to edit that into the OP because it is so awesomely awesome. Sponge wrote: Thanks for the awesome timeline link. I'm going to edit that into the OP because it is so awesomely awesome. Dear Sponge: I love you. My screen has gone all blurry. All those hours of weary lonesome toil have been worth it! But it could not have been done without the Anonymous poster who leaked all the SeaWeb information. OT 8 wins and completions. News source that reports on Cruise Ships. Not worth starting a new thread, but link might be useful for Freewinds watchers here. You’ve probably been following the controversy regarding the ‘Church of Scientology’ cruise ship, “Freewinds”, where a former Scientologist claims she was held on board for 12 years against her will. News outlets can cover this better than we can, but we thought you might like a look at the ship. This is the official Scientology video from the 20th Anniversary rechristening of the ship. Nice ride!